The full-size bikes fold in half. 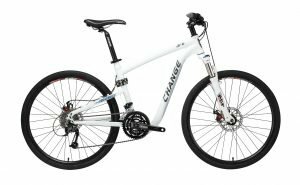 Which bike is right for you? 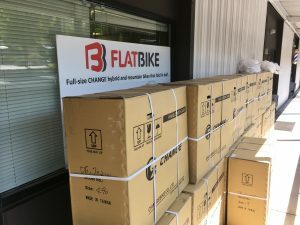 This morning, we unloaded a shipment of dozens of new bikes in the models and sizes that we’ve had trouble keeping in stock. 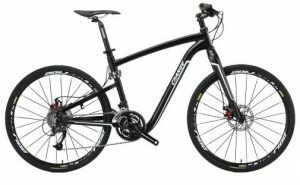 These include the 702 commuter bike in small size, and mid ranges of the 611 rugged hybrid and 612 mountain bike. We’ve already talked about these bike models individually, so this seems like a relatively good time to put them in context, sharing briefly what unique purpose each has. Then we’ll let our customers share in their own words particularly what they value about each model. At 23 lbs, this 24-speed is our lightest folding bike. We know of folks who have enjoyed the CHANGE 702 exactly as shipped, and others who have adapted it in two directions–either as more of a sit-up bike with a threadless stem extender or as more of a lean-over bike with drop handlebars. 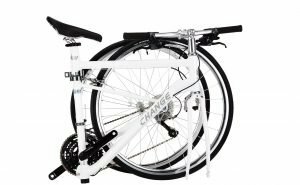 Either way, it folds up the smallest of all models, and is the only one with a kickstand that doubles as a latch to hold the folded bike together. I love my bike and I really appreciate the time and effort Bob took to help me select the right one. 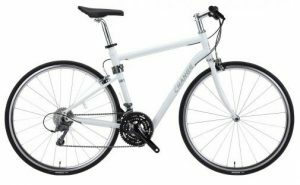 It shipped very quickly once I decided on the 702 commuter and Flatbike has continued to assist me with questions and suggestions. I ride it 10 miles into work, fold it up, and roll it into my office, where it sits safe and sound. If I can’t ride it home, unlike a normal bike, it folds and goes on the metro (in my city metro restricts non-folding bikes during peak hours, which is of course when I’m taking it). It is sturdy and speedy both. I highly recommend both the product and the service. 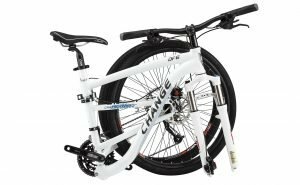 Priced hundreds of dollars less than our high-end MTB, the CHANGE 609 offers an economical mountain bike ride on 1.5″ tires, and 27 speeds to find the perfect granny gear for any hill. 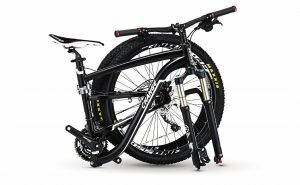 Whether your ride involves potholes, streetcar tracks, speed bumps, curbs, gravel, or simply missing sections of road, this bike can handle it. 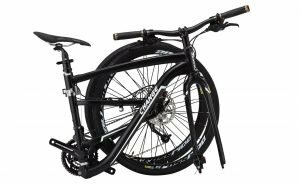 At 26 lbs, with a carbon fork and 1.5″ tires, the 27-speed CHANGE 611 travels well on anything that resembles a road or trail. It’s about three pounds lighter than the CHANGE 609, and the ride is different without a shock fork; while a 609 rides through speed bumps at speed, this one jumps them. I love my Flatbike. I own several bikes and my folding hybrid flatbike is my favorite bike to ride out of all of them. The fact that it folds and travels well is icing on the cake. 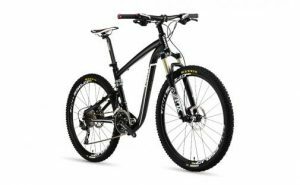 From the FOX air shocks to the Shimano hydraulic brakes, 30-speed gearing and knobby tires, the CHANGE 612 is a great hardtail mountain bike on components alone. And then a ruggedness-certified folding frame makes it possible to secure your bike anywhere. Your investment in outdoor adventure is safe at rest stops, restaurants…anywhere a car rack used to be a source of concern. We love these bikes. They are better and lighter than our Montague folding bikes. The front shocks are very high quality and lock out for road biking. They fit in the back of our little homebuilt experimental airplane. We take them with us for backcountry flying and camping. We will show them to our friends at the next backcountry fly-in. Now that they’re all in stock again, which bike is right for you?